Cost: $6,695 (Includes tuition, all fees, accommodation, travel insurance, food and transportation from Barcelona). Airfare to Barcelona is not included and ranges from $800 to $1400 depending of departure city. Deposit: $500 (required upon registration). BHNSFS reserves the right to cancel the camp if the minimum enrollment is not reached. The full deposit will be refunded or applied to another camp in this case, and applicants will be notified by email by January 1, 2019. July 13: Drive back to Barcelona - Earliest you can fly out is 3:00 PM. Spectacular view (looking northward) of Mediano reservoir and the Pyrenees. Ainsa is located at the north end of the reservoir. Introduction: The Pyrenees form an east-west trending, 200 km wide, 1500 km long natural boundary between Spain and France that formed during the collision of the Iberian and European plates 50 – 29 mya. This 5-week field course emphasizes basic field techniques, geologic mapping, and cross-section construction in a variety of classic Pyrenean geological settings – Eocene deltaic deposition during the formation of synorogenic piggy-back basins, folded and faulted Mesozoic rocks of the southern foreland fold-and-thrust belt, and Hercynian/Variscan metamorphic nappes. Students will spend four weeks working in the central Pyrenees on progressively more complex stratigraphic and structural problems and the final week working in multiply deformed metamorphic rocks of the Pyrenean Axial Zone exposed along the Mediterranean Sea. Lectures will include lessons on basic field techniques but will also emphasize the tectonic evolution of the Pyrenees. Prerequisites: Physical geology, mineralogy, petrology, stratigraphy/sedimentology, and structural geology. Projects: Students will spend the first couple of days learning basic field techniques including basic navigation, the use of the Brunton Compass, and how to measure stratigraphic sections. Emphasis will be placed on observational skills, recording field data, and basic geologic map construction. Students will learn techniques for measuring stratigraphic sections, collecting structural data in the field, cross-section construction, and simple structural analyses from field data. Students will also learn to synthesize their observations to construct an interpretation of the geologic history of the various field sites. The students will investigate the synorogenic deposition and deformation of Eocene deltaic deposits. This project involves measuring and description of basic pro-delta depositional sequences, mapping of deltaic lobes, and syndepositional deformation of the deltas in the context of growing piggy-back basins. Students will then map and examine larger scale structures involved in creating the piggy-back basins as the foreland fold-and-thrust belt developed. Students will also map more complex field relationships involving the thrust emplacement of Variscan nappes involving igneous, metamorphic, and sedimentary rocks. After a basic introduction to the metamorphic rocks of the Pyrenean Axial Zone, the final mapping project will involve detailed mapping of multiply deformed, amphibolite-facies, metamorphic and intrusive rocks. These projects are designed to build upon each other ultimately giving the students an overall understanding of the tectonic architecture of the Pyrenees. 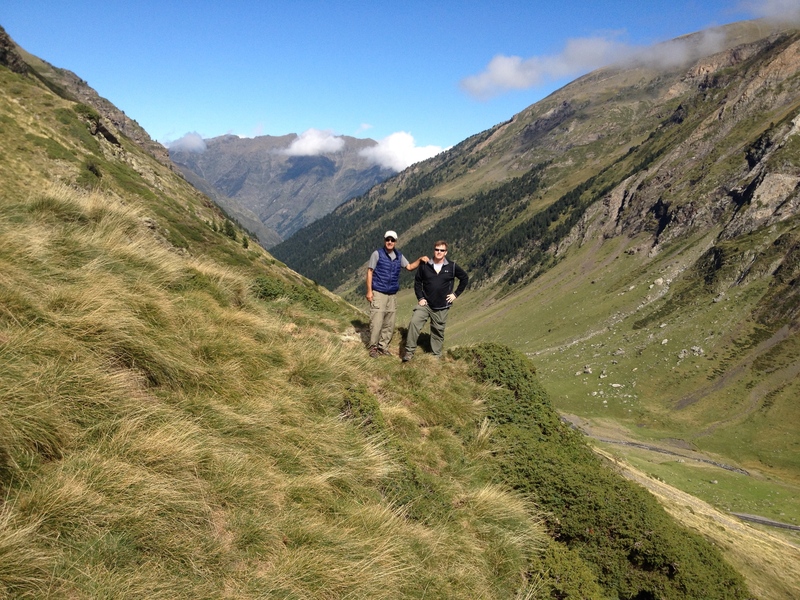 Physical Demands: Fieldwork in the Pyrenees involves traversing extremely rugged and steep terrain. Some projects may include demanding hikes of considerable length and elevation gain. We will be working at elevations from sea level up to 8,000 feet during the various projects. Students are expected to be physical and mentally prepared to work in these conditions. Climate: As with any mountain belt, weather conditions can change hour to hour. Temperatures can range from very hot to pleasant during the day depending on place and elevation. Nights and evenings are generally cool and comfortable. June and July are considered to be part of the drier season but students should be prepared for all types of weather, including cold, windy, and wet weather. The last week of camp will be spent along the Mediterranean coast with typical Mediterranean climate of warm, dry days and a constant, light sea breeze. Facilities: Lodging will be at a series of hostels in Ainsa and Roses, Spain. L’Ainsa is a small, medieval village that dates from the 11th century and is ideally located in the heart of the Sobrarbe Geopark. Roses is a larger, modern, tourist destination located along the famous Costa Brava. Students will share double occupancy rooms – each with a bathroom. Free Wi-Fi access is available at the hostels. Meals will be provided. The town of Ainsa has an outdoors store, similar to a small REI, should the need arise to replace or purchase gear. *A more detailed list will be provided after you sign up for camp. Field clothing: Field Pants (most projects do not lend themselves to denim jeans, shorts, or leggings); Comfortable boots (see above); fleece jacket for layering; wide brimmed hat; thin, light, breathable clothing that can be added or subtracted according to conditions.